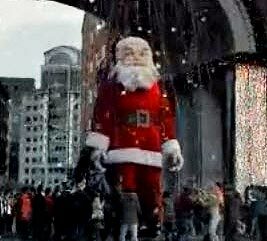 This year’s Christmas TV ad from Coca-Cola focuses primarily on a giant Santa Claus marionette – something of a departure from recent years’ ads (like 2010’s “Snow Globes” and last year’s “Shake Up Christmas” spots), which stuck with human personifications of Santa. 2012’s ad, dubbed “Together We Make the Magic Happen,” shows the “real” Santa (driving a festively lit-up Coke delivery truck) leaving a giant box outside the apartment building of a young woman who appears to be spending Christmas Eve alone. The ad, from McCann Madrid, is being rolled out in about 100 countries, reported Adweek. 1 comment about "Coke's Christmas Spot Features Giant Santa Puppet ". Neal Fondren from intermark group, November 27, 2012 at 2:35 p.m. This sounds a lot like Audrey from the Mayflower moving commercials. I guess I'll have to see it.